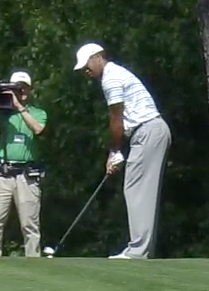 Tiger Woods is back in action. He arrived at Augusta National this morning to hit balls at the club's brand new practice facility before playing a round, according to the Golf Channel. Despite the significance of his return to golf, Tiger apparently treated it as any other day on the PGA Tour. Tomorrow will mark the first day that Woods plays in front of the general public. Augusta National was closed to members and players today, but the tournament officially begins tomorrow with practice rounds. Woods is set to deliver a press conference at 2 PM EST. We are now one week away from Masters' Sunday, and it is certainly shaping up to be a memorable one. No word has been given on how Tiger played today. 0 Response to "Woods arrives at Augusta National"